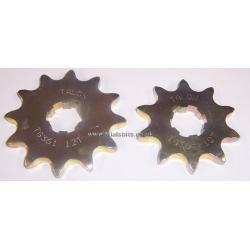 A Talon gearbox sprocket for virtually all Gas Gas models, except the Pro. Available with 9, 10, 11 or 12 teeth, please choose from the dropdown. If in any doubt, plase drop us a line and we can advise on the original fitment for your bike. This will also fit the JCM 240 Weekend, 240/325 Europa and the 240 SR.